WORLD-RENOWNED oceanographer and environmental campaigner Jean-Michel Cousteau will be heading to Bahrain for the first time next week to stage a two-day interactive session at The Ritz-Carlton, Bahrain just days after making a ‘diplomatic humanitarian’ effort to help ‘Save the Russian Whales’. In July and August of 2018, a collection of whaling companies captured 10 orcas and 87 beluga whales in the Sea of Okhotsk so that they could be sold to theme parks in China. The Russian Government has determined that the capture was illegal and they are not permitting the sale. The whales are now being held in ocean pens, which campaigners call ‘whale prisons’, near Nakhodka. The goal is to return the whales to the locations where they were captured in the Sea of Okhotsk so that they can be returned to their families. The whales cannot simply be released because they would not survive the current icy ocean conditions, far from their home waters, and without the help of their normal family and community structure. A team of scientists and experts assembled by The Whale Sanctuary Project are now in Russia to help the Russian government assess the current health of the creatures. Four of the whales are since believed to have died in their unnatural confinement. The team includes Jean-Michel, president of Ocean Futures Society, Charles Vinick, executive director of The Whale Sanctuary Project, and whale rehabilitation and release experts Jeff Foster and Ingrid Visser. The team also wants to help make plans for the return of the whales. Jean-Michel, Charles and The Whale Sanctuary team attended a press conference on Thursday in Vladivostok, along with the Russian Ministry of Natural Resources and Environment and others. Jean-Michel, 81, will help install video cameras in the animals’ pens that will ‘raise the chances of conducting a successful release of the animals into their natural habitat in the future’, local scientists said. The minister, speaking at the press conference with Cousteau, said the whales should be set free eventually. He claimed they hadn’t been liberated before because it was winter. Jean-Michel, who first dived with an aqua-lung in 1945 when he was seven-years-old, meanwhile, used his blog to highlight the importance of the whales. 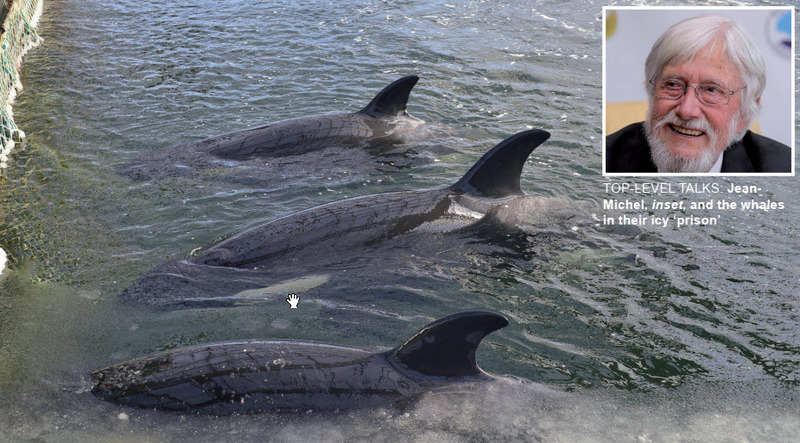 “We have reached a point in our human evolution where people are realising that cetaceans, including orcas and dolphins, are far too intelligent, sophisticated and socially and behaviourally complex to be kept in concrete prisons,” he wrote. “In captivity, they suffer from mental distress, physical illness and shorter lifespans than they would live in their natural ocean homes. ‘Protect the Ocean and You Protect Yourself’ is one of his campaign mottos and his latest endeavours will surely be one of the hot topics up for discussion during his visit to the kingdom. This coming Monday and Tuesday he will be taking young audiences and adults alike on a ‘land to sea’ journey unveiling his life-long expeditions and explorations of unique ocean environments and the natural wonders of the world. For more than four decades, Jean-Michel has dedicated himself and his vast experiences to communicate to people of all nations and generations his love and concern for our water planet. His foundation, Ocean Futures Society, a non-profit marine conservation and education organisation based in Santa Barbara, California, serves as a ‘Voice for the Ocean’ by communicating to audiences the critical bond between people and the sea and the importance of wise environmental policy. As the son of pioneering sea adventurer Jacques Cousteau (1910-1997), who was best known for his TV series The Undersea World of Jacques Cousteau, Jean-Michel continues his father’s legacy, serving as an impassioned ambassador of the environment, reaching out to the public through a variety of media and educational programmes. GulfWeekly attempted to contact the explorer for further comment and Nancy Marr, who helped found Ocean Futures Society with Jean-Michel, said they were both ‘very much looking forward’ to the Ritz-Carlton, Bahrain engagement. They will also be travelling to a sister property in Dubai for a similar presentation. “Please be advised that Mr Cousteau is unavailable due to being inaccessible in Russia due to the diplomatic humanitarian efforts to Save the Russian Whales,” she explained. Complementing Jean-Michel’s visit, the resort has launched a new Land to Sea adventure package. Greeted by Pearl 1’s Captain Hussain, families will arrive to the 20-acre beachfront resort for a fun-on-the-sea family adventure with dolphin-watching excursions, paddle boarding and kayaking activities, sandcastle building, crab hunting and more. And, by Captain’s order, little shipmates will also enjoy their very own sailor’s hat, binoculars set, bath time ‘sea rubber toys’, treasure hunt map, and even their own Ritz Kids ‘look out’ chair on the resort’s private island. Starting at BD362, the family package for a family of four (two adults and two children aged from four to 12) and includes Ritz-Carlton Club Level accommodation with club lounge access. A two-night minimum stay is required for bookings until December 31. Call 17580000 for more details, or visit ritzcarlton.com/Bahrain. Follow the hotel on Facebook and Instagram @ritzcarltonbahrain and join the conversation using #RCMemories #RitzCarltonBahrain.